Thank you to Sony and Intel for giving me the opportunity to review this camera. The all new Sony Bloggie™ Touch camera is targeted at those who are looking for a small pocket camcorder. The camera is small, and light weight making it perfect for those who want something they carry in their pocket or purse. The camera boast an impressive 8 gig flash drive, an 8 mega pixel camera in a wide 16:9 mode, and 12 mega pixels in a full screen mode 4:3. Along with stills the Bloggie Touch takes video with a surprising array of flavors in such a small package. The different modes of HD video are available are 1080p, and 720p, but the kicker here is the ability to record not only 30 frames per second (fps) but 60 fps as well! However, this is only in 720p mode. What does this mean? Well, to put it simply you can take some fantastic slow motion footage. However the real star is the stunning 3” touch screen that displays your pictures and videos with great quality. Using the camera is pretty intuitive, and fairly easy to navigate. Just turn it on, and begin shooting. The internal mic does a decent job at picking up audio, which means you can use it to record your very own Vlog. However, if you are recording yourself you may want to use a mirror to make sure you are in frame as there is no preview mode. Sharing your photos with friends, family or everyone on Facebook is the real highlight here. You can easily preview and select the pictures/videos you want to share later with a touch of the button. To make things even easier Sony added a USB flip out stick to the bottom of the camera. This means no matter where you are, sharing has never been easier. Plugging the camera into a Window 7 Intel based machine and everything worked like a charm. Issues only arrive for those of you on Macs. Unless you have access to the latest high end editing software, its a little complicated to get your media off the camera, but not impossible. You can simple open up the folders, look for your Jpegs and movie files, and then just drag and drop. 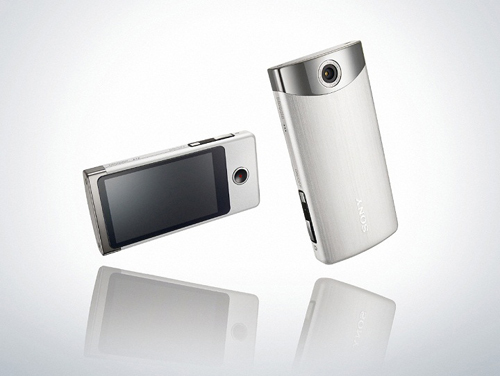 The Sony Bloggie Touch camera is a fantastic small device with the ability to take 1080p HD video. Its small enough to carry around to catch those candid moments in you life, with out feeling like your are carrying it at all. Spend enough time with it , and you begin to realize how valuable this small camera can be to catch everything from your newborn son being born to watching the smile on his Great Grandmother’s face as she meets him for the first time. Uploading pictures to Facebook is so simple with the Sony Bloggie Touch, there really is no excuse for not entering the Intel Get In to Win contest on Facebook. Enter your favorite picture or video to compete in over $20,000 in prizes or even win the grand prize worth over $4,500. Note: this contest is only open to Canadian residents. Just simply click the image below to go the contest.. Submit your entry to me by December 21st and I’ll post my own contest winners for the Bloggie Touch and Vegas production suite on that day. Again, only open to Canadian residents that reached the age of majority in their province.